Nicosia Airport continued to be used for both civil and RAF military flights with the Control Tower staffed exclusively by British military controllers. After independence, eight Cypriots were sent for air traffic control training and by 1963 had replaced their British counterparts. Aircraft using the Nicosia FIR (Flight Information Region) were controlled by the Air Traffic Control Centre situated a few hundred metres north of the terminal facilities and the airfield control tower. This centre was also exclusively manned by RAF personnel who were also replaced by the end of 1964. In 1960, the number of flights through the Nicosia FIR was 32,637. Seven international airlines operated scheduled flights into Nicosia carrying 147,000 passengers and there were a further 6,615 freight flights. On the 5th April 1960, BEA introduced the de Havilland Comet 4B on the Nicosia, Athens, Rome and London routes, becoming the first airline in the region to use jets. From 1961 the resident fighter unit was 43 Squadron flying Hawker Hunters (FGA.9). The Station Commander at the time was Group Captain John (Pat/Paddy) Campbell (who had taken over command of RAF Nicosia from 'Mick' Martin of Dambuster fame) and in March 1963 the resident squadron moved to Aden. The replacement for the departing 43Sqn was 29Sqn equipped with Gloster Javelins. 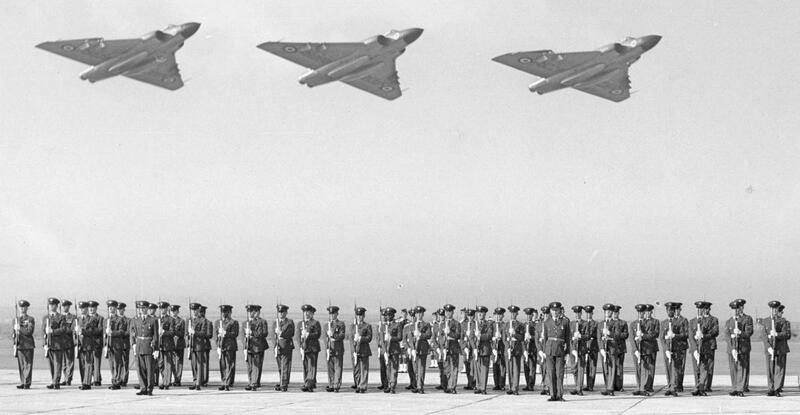 On March 1st 1963, RAF Nicosia received a full Station Inspection by Air Chief Marshal Sir Denis Barnett (Chief Near East Air Force and Commander British Forces Cyprus). After a successful inspection, the Air Chief Marshal departs in his Sycamore helicopter. Despite the inter-communal troubles that began in December 1963 (when, for a short period, the Javelins were moved to RAF Akrotiri) the airport continued to attract new civilian users and, on the 28th February 1964, Aeroflot was added to the growing list of airlines. RAF Nicosia was very busy during this period (Dec 63-Mar 64) with the British Truce Force HQ being based here for several weeks and then the setting up of the UN Flight in March 1964..........see Military Histories....The Green Line for more information. The UN were supported by RAF Sycamores & Whirlwinds are well as fixed-wing Austers and Beavers. 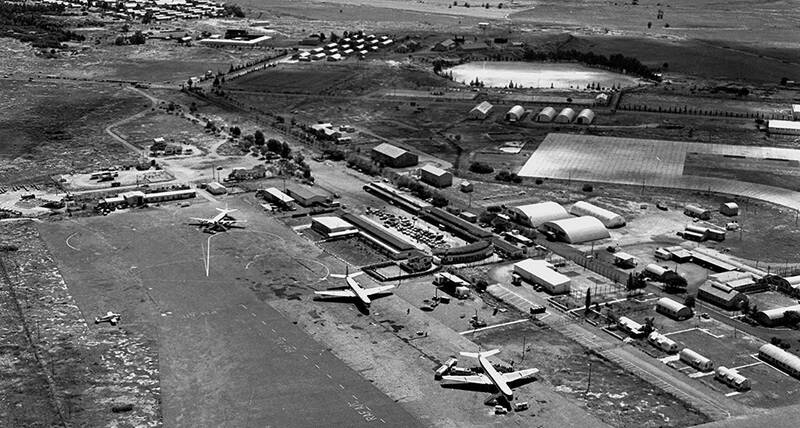 The 1966 British Defence Review announced the closure of RAF Nicosia and military flying due to the huge growth of commercial flights. Most areas were handed back to the Cyprus Government shortly afterwards but the RAF held on to several small retained sites with the former 79 OTU buildings remaining as UNFICYP HQ. Also in 1966, the UN Flight became an established unit operating only helicopters (the fixed-wing assets were withdrawn). On the 20th April 1967 there was a sad conclusion to this period of the airport's development. A Bristol Britannia (HB-ITB) operated by Globe Air was bringing tourists back from Bangkok to Basel in Switzerland. The crew diverted the flight to Nicosia due to bad weather at Cairo. The aircraft was on its third attempt to land on Runway 32 in a violent thunderstorm when it flew into the ground near the village of Lakatamia and burst into flames. 117 passengers and 9 crew were killed but four people miraculously survived. The capacity of the existing terminal buildings at Nicosia Airport was limited and rather primitive in both appearance and facilities offered. It was decided therefore that a new terminal was required in order to manage the rapidly increasing number of airlines and passengers using Nicosia.